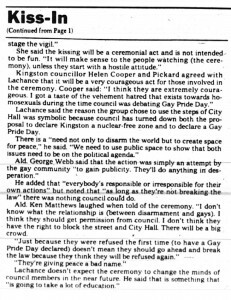 Street Address : 217 Ontario St.
On August 8, 1985, the front page of the Kingston Whig-Standard blazed with the headline “Gay Anti-nuke kiss-in idea shocks city mayor”. 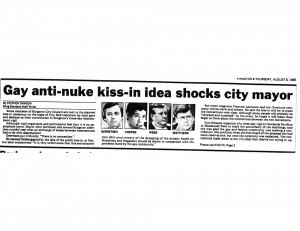 Kiss-in organizer Francois Lachance explained to the paper that the 15-minute ceremony would make clear the connections between the anti-nuclear movement and the gay movement. 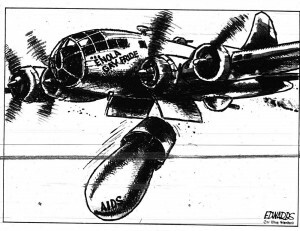 Organizers of the three-day vigil to mark the bombing of Hiroshima and Nagasaki were glad of the addition of the kissing ceremony to their other events, but, as the Whig noted, Mayor John Gerretson and several aldermen “couldn’t see what an exchange of kisses between homosexuals had to do with disarmament”. 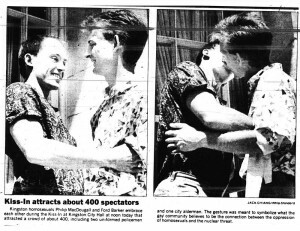 Despite complaints that they were “giving peace a bad name”, the ceremony went ahead on August 9 with a speech from Lachance on the steps of City Hall and then a 5-second embrace and kiss between Philip MacDougall and Ford Barker. The crowd reacted with applause and a few boos. Not only did the ceremony attract a crowd of 400 onlookers, but photos of the kiss were printed on the Whig’s front page. 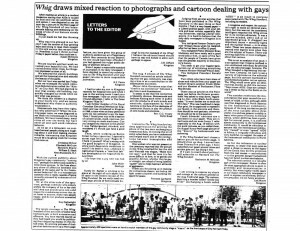 In a follow-up article, the paper described it as “a kiss that reverberated throughout Kingston”, and community responses ranged from appreciation, to fascination, to outrage. 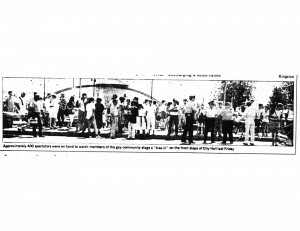 Although critics of the ceremony seem to have been more common, or at least more vocal, than supporters, the discussion sparked by this very visible event may have had positive effects. Lachance commented that the large crowd of curious onlookers was a “healthy sign” because “that’s how one teaches”.